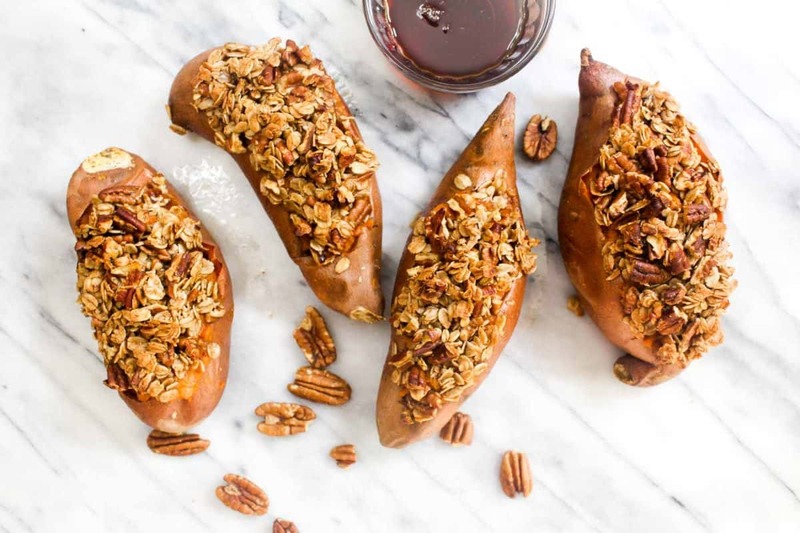 These Crumble Topped Twice Baked Sweet Potatoes are an easy 6-ingredient Thanksgiving side recipe. 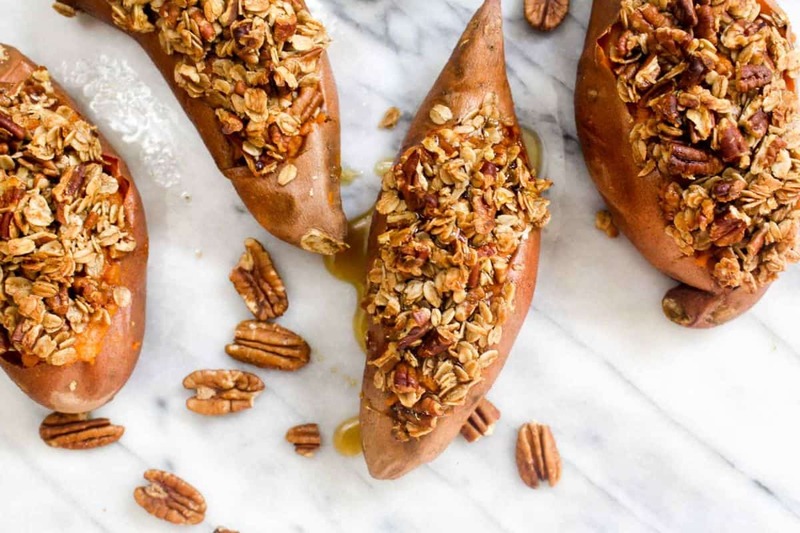 All the flavors of sweet potato casserole get baked right inside the sweet potato skin. I have yet to attend or hear about a Thanksgiving dinner that didn’t include sweet potatoes in some form. Whether they are mashed, roasted, baked alongside the turkey, casseroled, or smothered with marshmallows, they are a classic Thanksgiving side dish. These Crumble Topped Twice Baked Sweet Potatoes are a fun twist on Sweet Potato Casserole. They have all the same flavors, but get baked right in the sweet potatoes – and that means one less dish to clean after the big dinner. 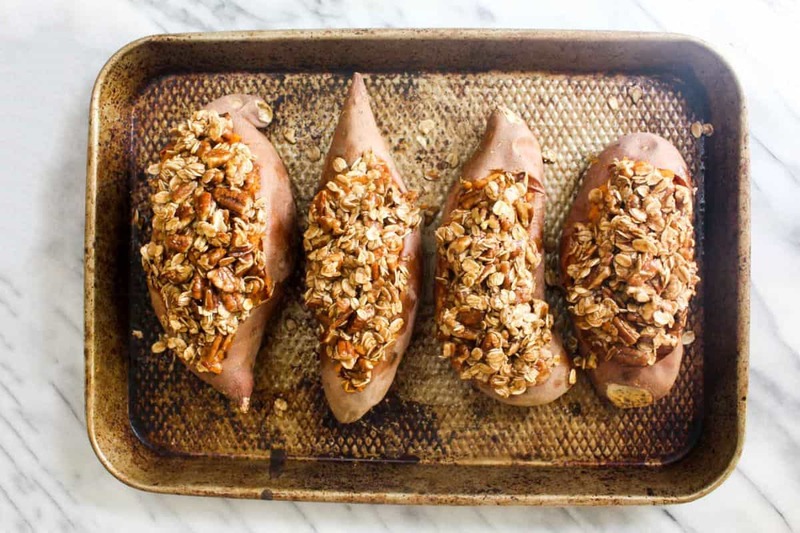 To make these Crumble Topped Twice Baked Sweet Potatoes, you start by baking as many potatoes as there are guests coming to the meal. After the potatoes are tender, you cut an oval in the top, remove that skin, and scoop out the soft flesh leaving a small amount to help prop up the skin and give it structure. The scooped-out flesh gets mashed with coconut oil, maple syrup, cinnamon, vanilla, and a pinch of salt to bring out the flavors. Then just scoop this mixture back into those skins. 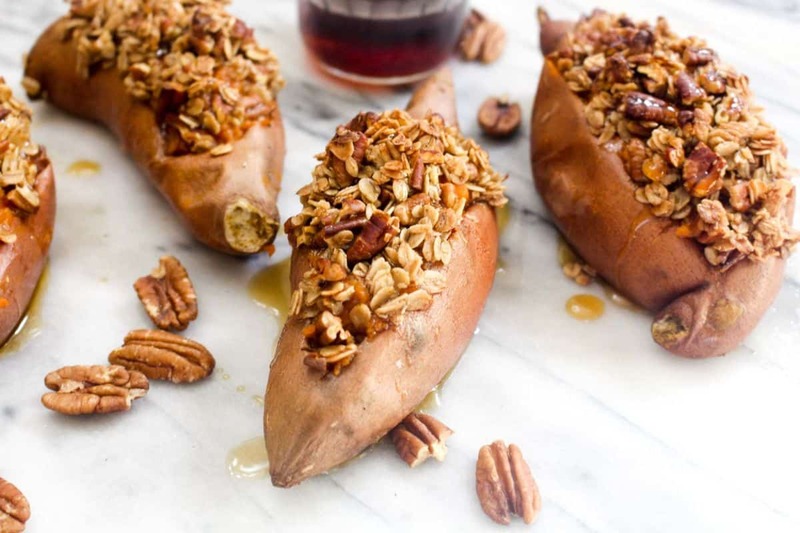 The filling is great on its own, but what makes these Crumble Topped Twice Baked Sweet Potatoes extra special is the crumble topping. 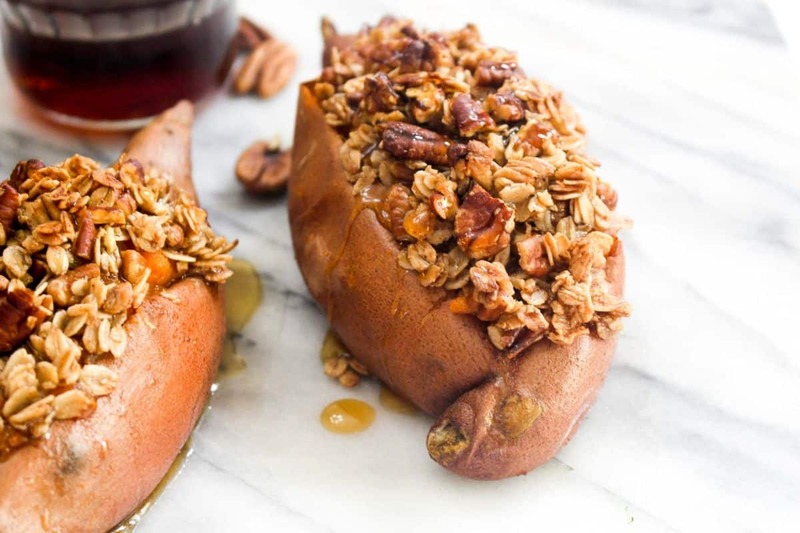 Oats, pecans, maple syrup, and coconut oil get stirred together and then packed onto the top of the sweet potatoes. Then it’s into the oven until the crumble is golden brown. 1. Preheat the oven to 400 degrees. 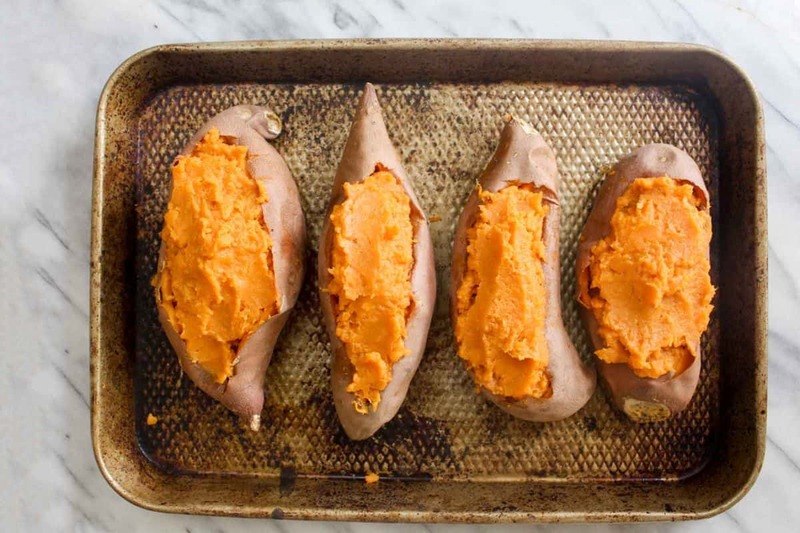 Line the sweet potatoes up on a baking sheet and bake the sweet potatoes until soft to the touch, about 30-60+ minutes depending on the size of your sweet potatoes. 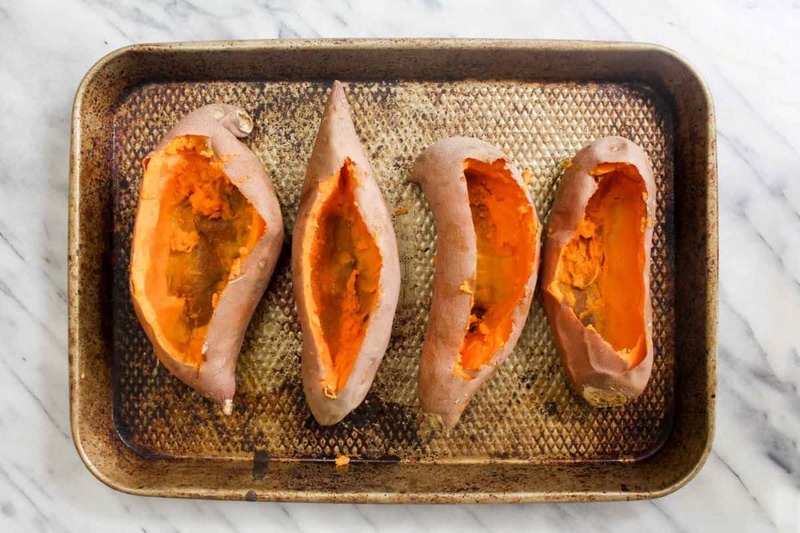 Once the sweet potatoes are cooked, cut out a circle in the top of each potato and scoop out the insides, leaving a thin layer of flesh behind. 2. Mash the filling and stir in the maple syrup, vanilla, cinnamon and salt. 3. Spoon the filling back into the potatoes. 4. Stir together the crumble ingredients.Top with crumble and bake until golden brown, about 15 minutes. 5. Serve with an extra drizzle of maple syrup. These Crumble Topped Twice Baked Sweet Potatoes are the perfect Thanksgiving side. 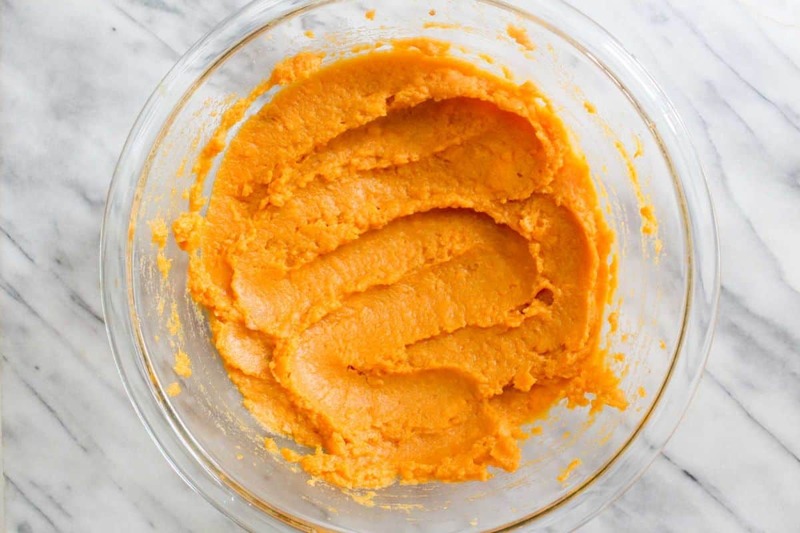 This simple recipe only requires 6 ingredients and is mostly hands-off cooking! Baking the casserole right in the sweet potato means one less pan to wash and an easier (and tastier!) Thanksgiving.